Music is an important part of our worship at Holy Trinity and we are blessed with many talents and a wonderful organ. The Choir and organ support most of our 10:30am services, leading the congregation in singing, and at special festivals and events, both within and as its ambassador outside the Church. We strive to enrich our worship in hymns of praise, psalms and anthems. There is also a Gospel Band that serves All Age Worship the first Sunday of the month. During the past year we have sung at many special services or events, such as the Choral Evensongs or the Festival of Nine Lessons and Carols, the Organ Anniversary Concert and Lichtjestocht around Wilhelminapark. They are all a vital part of offering our Worship to God. The Choir welcomes anyone to join and strengthen our singing, and you do not need to be an experienced singer or to sing at all the services. It can be a joyful experience where we share fellowship and learn from each other. 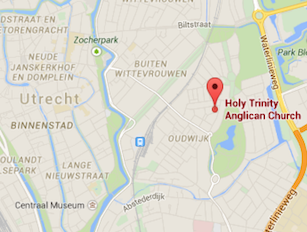 Choir practice takes place every Thursday evening from 20.00 to 22.00 in the church hall, van Hogendorpstraat 26, Utrecht. The last choir practice before the summer break took place on 7th June. Choir practice will resume on 30th August.